Britain has chosen to leave the European Union and now analysts warn that other European countries may feel inspired to carry out their own referendums. Scotland’s first minister, Nicola Sturgeon, announced that Scotland “sees its future as part of the EU,” suggesting that Scotland may hold another referendum to decide whether to separate from Britain and re-negotiate an entry into the EU as an independent country. The Irish political party Sinn Fein, meanwhile, called for a referendum on uniting Northern Ireland with the rest of Ireland as the Brexit results came in. France’s Marine Le Pen, leader of the far-right National Front party, called the Brexit “victory” — and then changed her Twitter avatar to the Union Jack. Meanwhile, the party’s vice president, Florian Philippot,called for a French referendum on leaving the EU. 1. 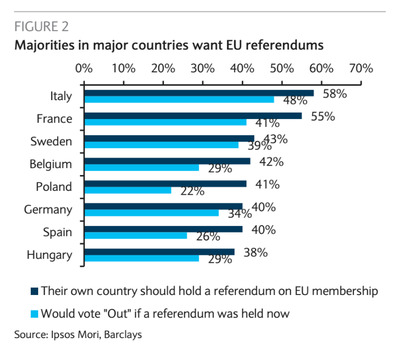 The percentage of respondents in a given nation who think their country should hold a referendum on EU membership. 2. The percentage of respondents who would vote “out” if the referendum was held now. 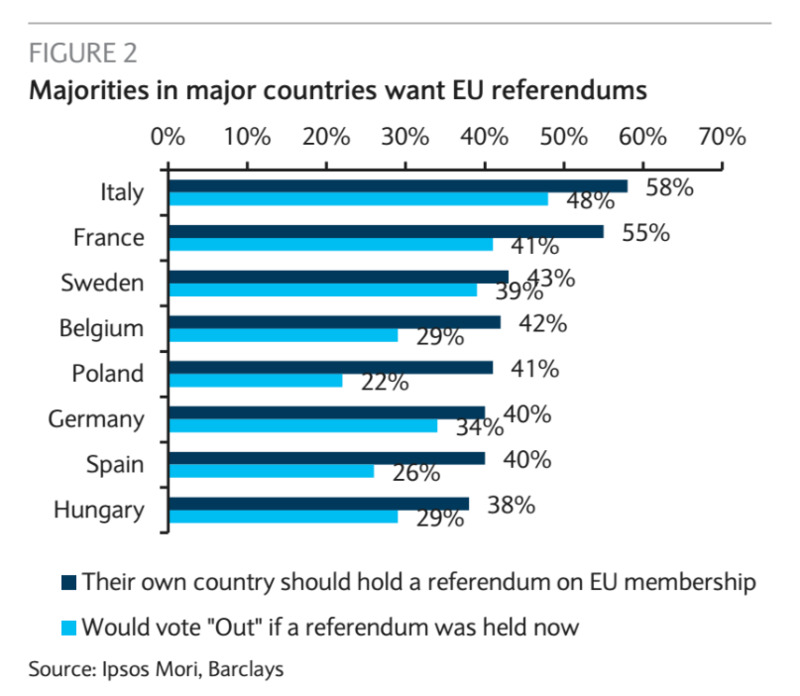 The poll suggests that “nearly half of euro area citizens wanted a referendum on EU membership in their own country, including majorities in France and Italy,” Rajadhyaksha wrote in the note. “Anxiety over immigration and a weak economic recovery have greatly eroded pro-EU sentiment in the euro area,” he added.